Picture this: You’re out to dinner with your family, and at the next table over you spy a little boy who is sitting with his own family, his eyes glued to a screen. Maybe he is playing a game. Perhaps he is watching a movie. All you know for sure is – you haven’t seen him look up once. Not the entire meal. We’ve all witnessed a similar scene before. And most of us have probably been the parents with that child glued to the screen ourselves. It isn’t something to judge – you never know the circumstances behind that level of engagement. It’s possible mom and dad really just needed a chance to talk and connect themselves, and so they allowed more tech usage during this one meal than they normally would. Or maybe you are witnessing a special needs child who requires that distraction to handle public outings comfortably. Questioning another parent’s choices isn’t the point here. But as parents ourselves, I think most of us can admit that we would like to prevent our own children from becoming too addicted to tech. So addicted, that they might spend an entire meal not once looking at us. The problem is that technology is becoming a more prominent piece of our society every day, and escaping it entirely isn’t an option – at least, not if you want your child to be able to find success in a world that is implementing more tech use at every turn. 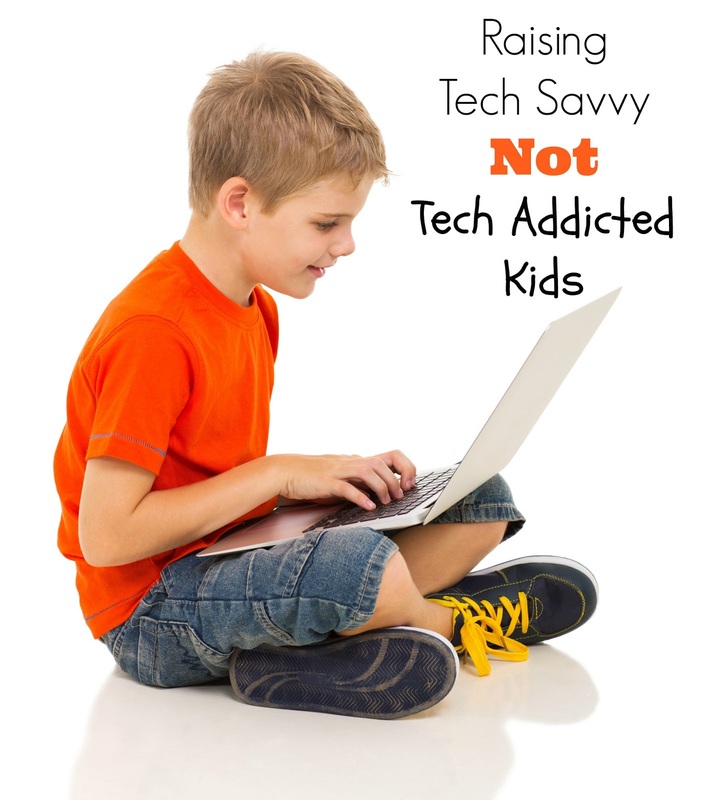 You want your kids to be tech savvy, you just don’t want them to be tech addicted. The boom in technology we have seen over the last decade is neither all good or all bad. There are dangers and drawbacks to be aware of, for sure, but there are also a lot of amazing benefits. Learning apps for kids are providing opportunities to teach colors, numbers and letters at a younger age than ever before. Traveling is so much easier now that tablets provide entertainment possibilities on the plane. And staying connected with those we love, despite the many miles that sometimes exist between us, is suddenly possible in ways we likely never imagined. There are absolutely some amazing benefits to all this technology we are exposed to – and there is absolutely nothing wrong with acknowledging and embracing that. The key is to spend some time really monitoring and learning about how your kids are using all this tech. The sad truth is, most of our children probably know how to navigate the ever-changing technological landscape better than even we do. Have you ever seen a 2-year old work an iPad? It’s a pretty amazing thing to watch! So understanding that not all tech use is bad, you just want to figure out what your kids are getting out of their tech use. Are they playing games? Chatting with friends? Studying? Talk to your kids about how they use their tech, and ask them to show you some of their favorite apps and online activities. The more you know, the better prepared you will be for setting limits when necessary. None of us wants to raise a generation of kids so addicted to their tablets that they become vitamin-d deficient shut-ins. So find ways to get your kids outside and active every day as well. Maybe this means signing them up for group sports, or appealing to another passion of theirs; like horseback riding or rock collecting. The goal is simply to get them engaged in activities that don’t involve tech use; allowing for moderation and variation in everything they do. One of the best ways to prevent tech addiction is to create clear guidelines around tech use – but how do you accomplish that in a way that doesn’t result in fights night after night? OurPact is a great place to start. This free app from ParentsWare gives parents the ability to schedule Internet and App use according to your child’s daily routine, and to block Internet and Apps across all of your synced Apple Devices. Parentsware explains that their vision, “is to advance the future of parenting and enrich the lives of children through the responsible use of technology.” With clear and defined boundaries, your child will know exactly when they are allowed to utilize their tech. And exactly when they should instead be engaging with the family. Finding that balance isn’t as difficult as you might think, so long as you are willing to rein in your own tech use as well. Set the example, and show your kids how to embrace the benefits of technology without allowing those benefits to overtake their lives. Setting limits on there tablets is a must for us, even on there gaming devices too. We love the benefits of the devices since they are mostly for educational use, but there can be times when they want to always be on them, so setting limits is important. This is a post that every parent should read! I am 100% in agreement with you that balance is the key. It can be really hard. My son is grown now and it was hard 20 years ago and I can only imagine how much harder it is now with so much technology bombarding us at every turn. I am sharing this with everyone! SO many important points here. As with so many things, too much of a good thing can be so destructive. Great post! These limits are soooooo important. I'm a teacher who also sees how schools are trying to use more tech (think classes in the computer lab) to keep students engaged. I'm not sure this is the way to go. I also do a lot of tutoring, and some of my parents will have their middle and high school aged students "turn in" their phones during homework and dinner time. Then they get them back around 8 or 9 PM.